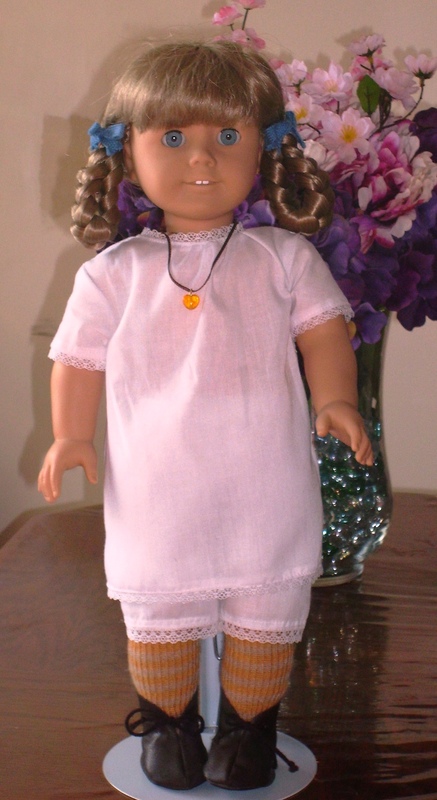 I used book club weekend to catch up with some more doll sewing, mainly doll undergarments. I had previously cut out 2 of Kirsten’s chemises from the Pleasant Company’s Kirsten’s Pretty Clothing. 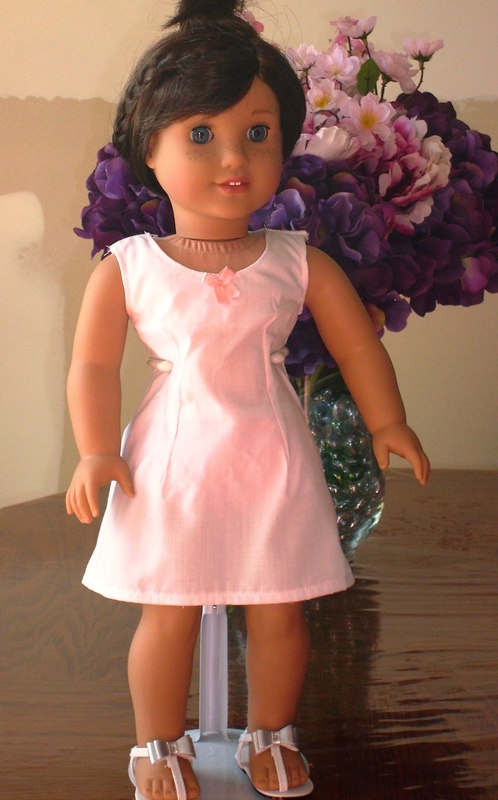 These pattern are of the actual collection that at the time Pleasant Company made for the American Girl dolls. 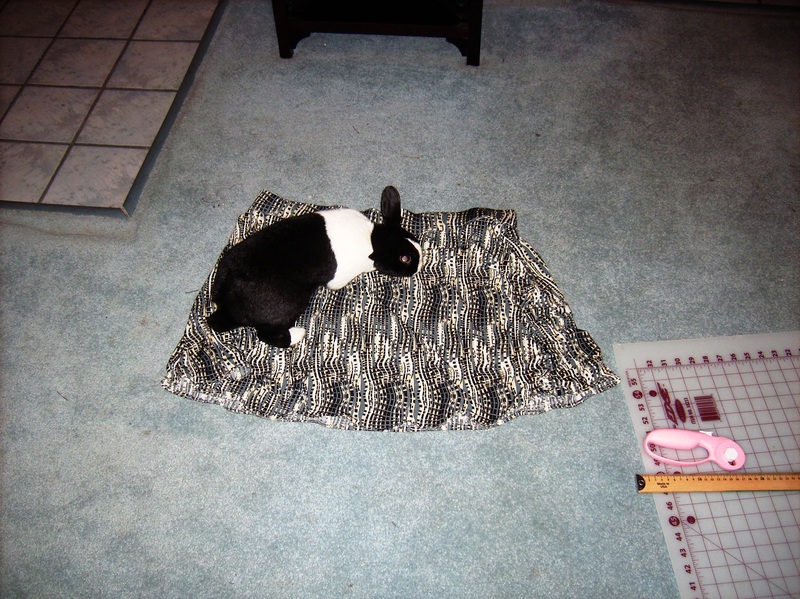 I was able to put both chemises together in one afternoon (including a break for lunch and tea time because some bunny would be mad if he didn’t get to eat). I think my chemises are from white broadcloth cotton. I used a little over 1 spool of lace for both (but I added lace at the bottom hem which the pattern doesn’t include). So as to the pattern. It does go together fairly easily. I like the neckline lace finish but I do not care for how it is completed. There are sections on the neckline that should be gathered to recommended lengths stated in the instructions and you are to stitch the gathers in place. After the gathers, one then applies the lace. No overall neckline length is stated for the lace piece. I don’t feel that this gives the most reliable of finishes. I would much prefer to sew the gathers in place to a piece of bias trim then apply the lace to the top of that. I understand the recommended method has less bulk and can still yield a clean finish but am still not fond of it. The recommended closure was a small button and buttonhole. Pattern just says small button. I decided to use Velcro instead. For one thing, I know my machine hates doing button holes for small quarter-inch buttons. Secondly, the quarter-inch buttons are hard for me to close so I would assume a child would have similar difficulties. 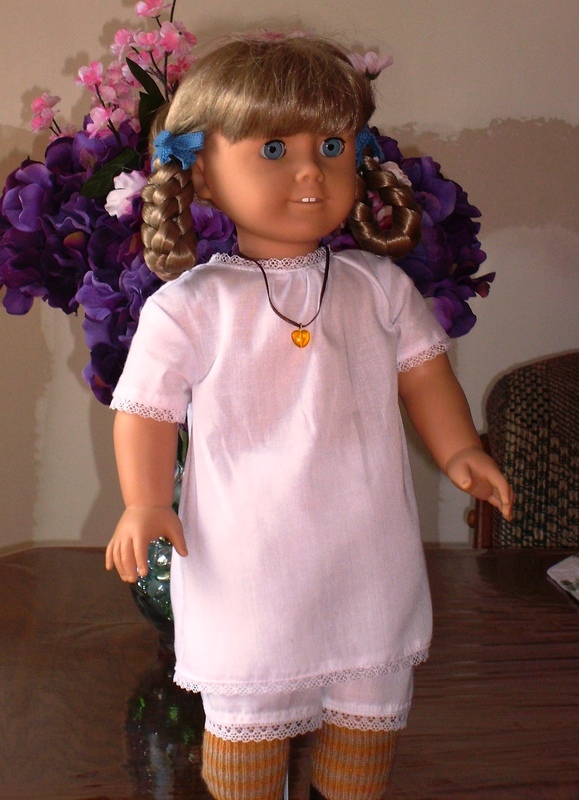 As a reminder, my Kirsten doll was purchased somewhere between 1993 to 1995. The chemise does have a loose fit. 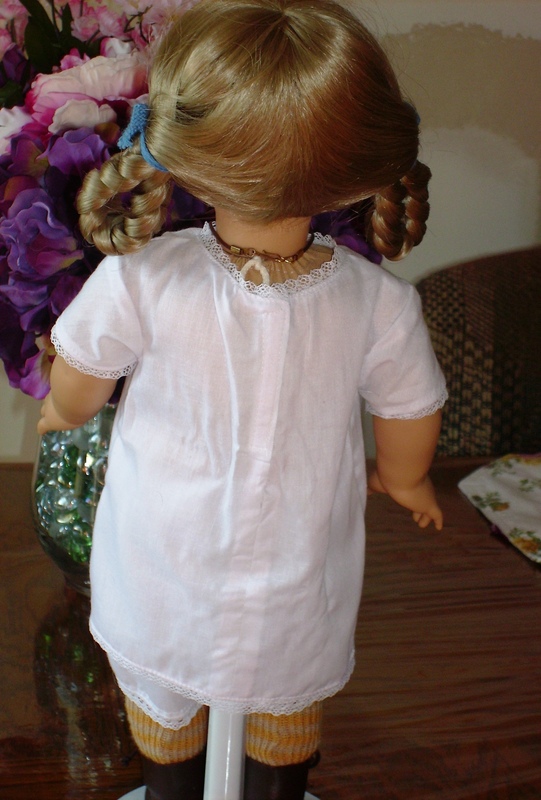 For any of the newer Mattel dolls, definitely try on the chemise before finishing it up as those dolls are usually thinner than my older dolls. This chemise would probably be huge on them. I think the picture below shows the looseness well. 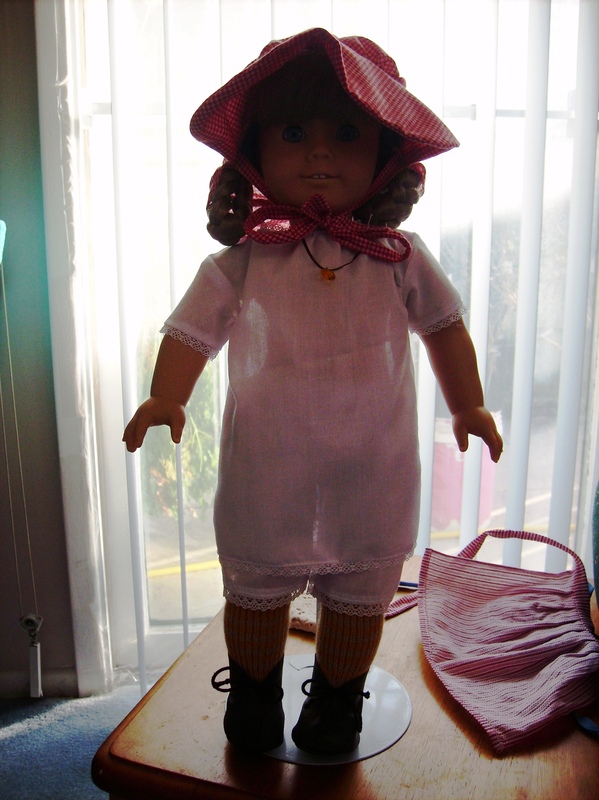 Right now, all sewing focus has been on doll clothes. Using the fabric I used for the Sew Small contest as the inspiration, I decided to sew up another version of “Molly Waves Goodbye” from Lee & Pearl. This will be time three of making the suit jacket and skirt. 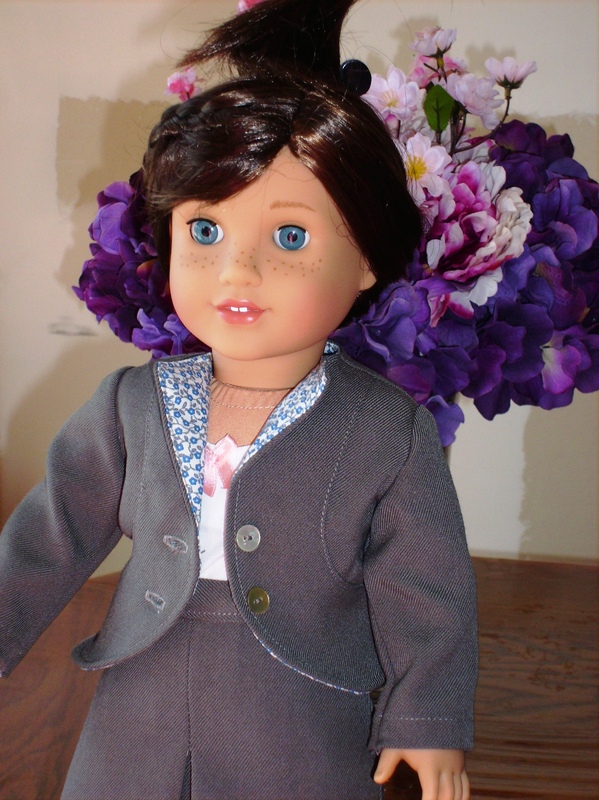 I did make this earlier in the year for my dad’s work “Toys for Tots” drive because what doll would not like a 1940’s style suit. I also had the slip cut; this is the first time I am making the slip. For this jacket I used the grey wool flannel for the outside fabric and the blue floral quilting cotton for the lining. The slip uses white cotton (most likely a broadcloth as I can’t remember because this had been cut out for a while). The slip is rated as intermediate and that would be fairly accurate. It is partially lined at the top, darts, French seams, and the back has a placket. 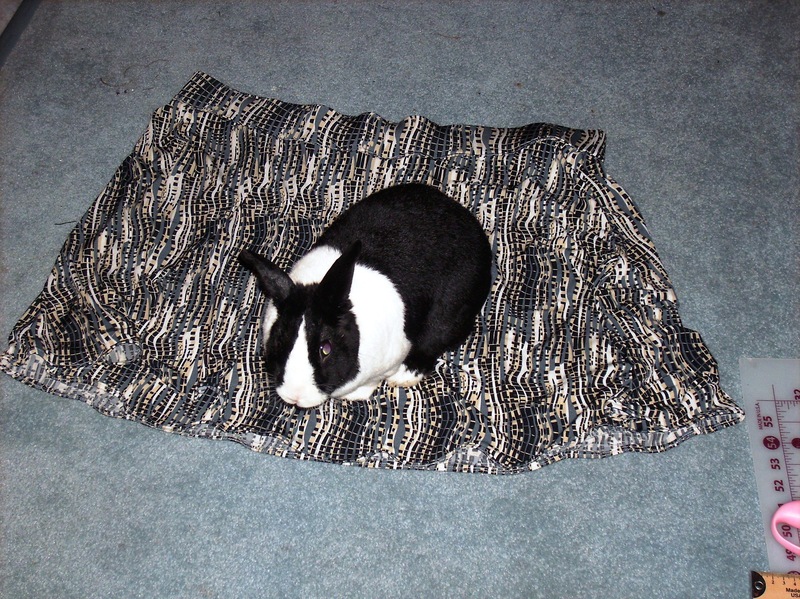 Inserting the partial lining is probably the trickiest part. I did have the instructions pulled up on the computer to refer to between steps. But otherwise, I didn’t have too much difficulties in making this slip. I did take the bow off of an old bra because the one I tried to make didn’t look as nice. I used Velcro to close the back instead of snaps. 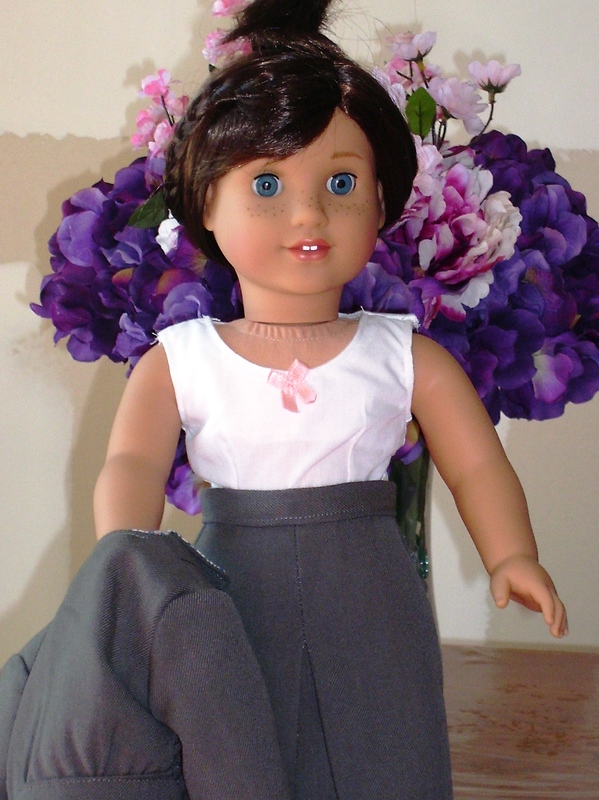 My model is Grace, last year’s Girl of the Year doll. The slip fits her very snug. 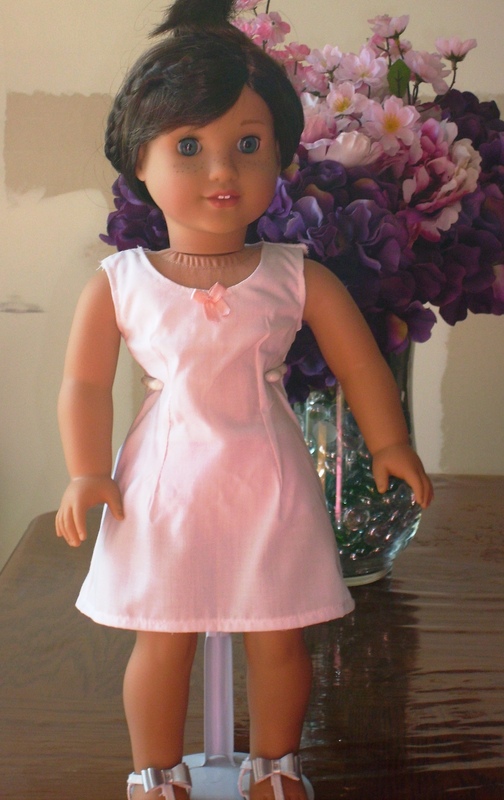 As for my older dolls, I definitely would need to add at least a quarter of an inch to get the slip to fit them (if I want to keep the French seams and use Velcro). As is, I think this slip back Velcro would pop open for them. So I decided that the boot cuffs I started at the beginning of December needed to be put on hold during the week of Christmas. The break from the boot cuffs was very nice. I had recently picked up the book Crochet Boutique: Hats: 25 Fresh Takes on Classic Crocheted Hat Designs by Rachael Oglesby. The book has a decent variety of hats and difficulty levels in it. 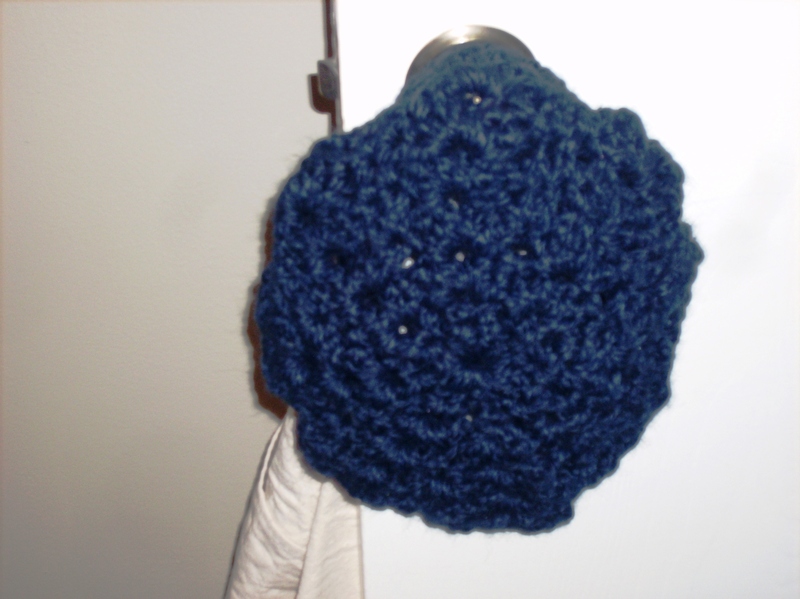 I started with the first pattern “Bulky Shell Beret” because it was rated beginner/easy and used the Lion Wool-Ease Thick and Quick yarn to make. The pattern went together fairly easily. I understood the instruction. 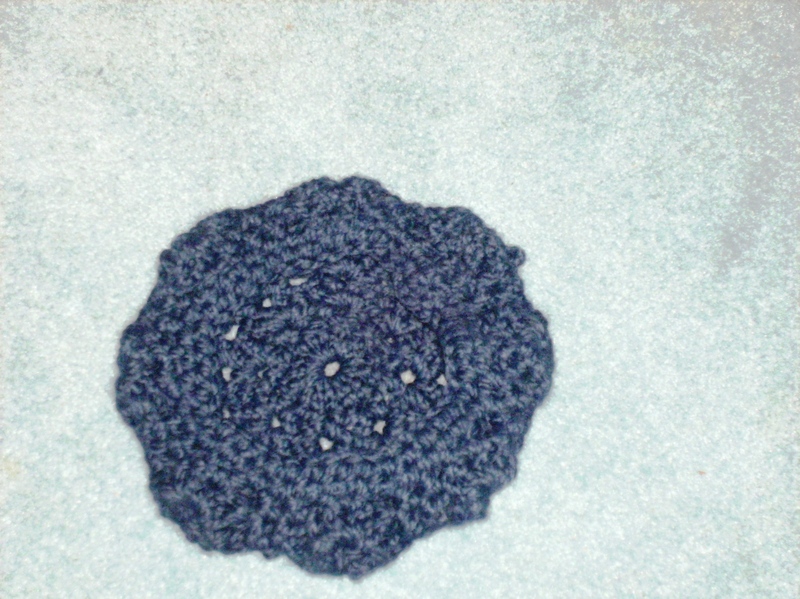 The first try at this pattern took me about four hours (split over two days) to complete. 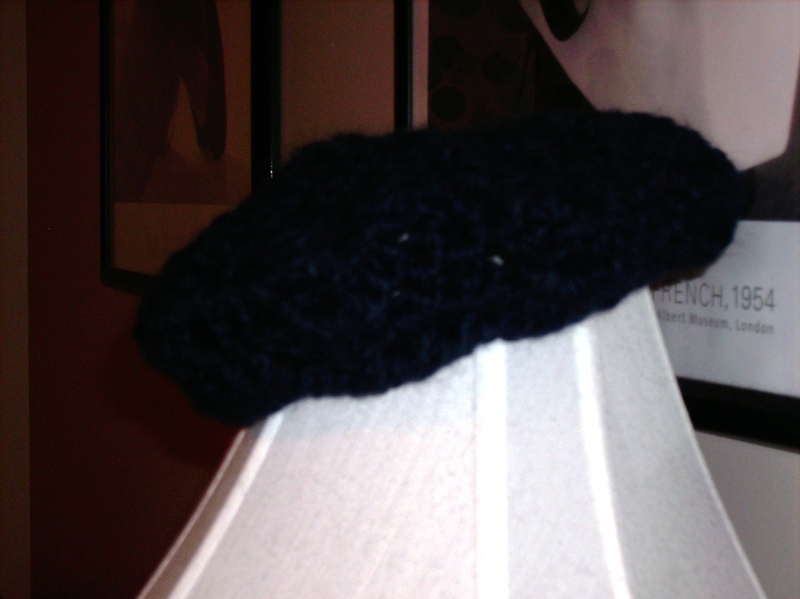 I used the 9mm (N) hook for the beret. I did not have the best of slip stitches over to the chain one on the shell. It ended up too small. The second time, I used the 10mm (N) hook. It came out much better and had a better fit for me. The second try probably took less time to make than the first. So I tried really hard to get a photo of the skirt without Lala on it and it was near impossible without locking him in his cage. Pictures with bunny it is then. This is the present I made my mom for Christmas. I used the size 22 for a start (37 in waist); then adjusted it for a 44 inches total. I divided this evenly between the front and back. At the back I added to the center back about 1 inch (for 2 inches total) then the rest went to the side seams. The front I did slash and spread some and then added the last on the side seams. The skirt does have pleats on the front wrap (to be honest they do get lost in the print of the skirt). 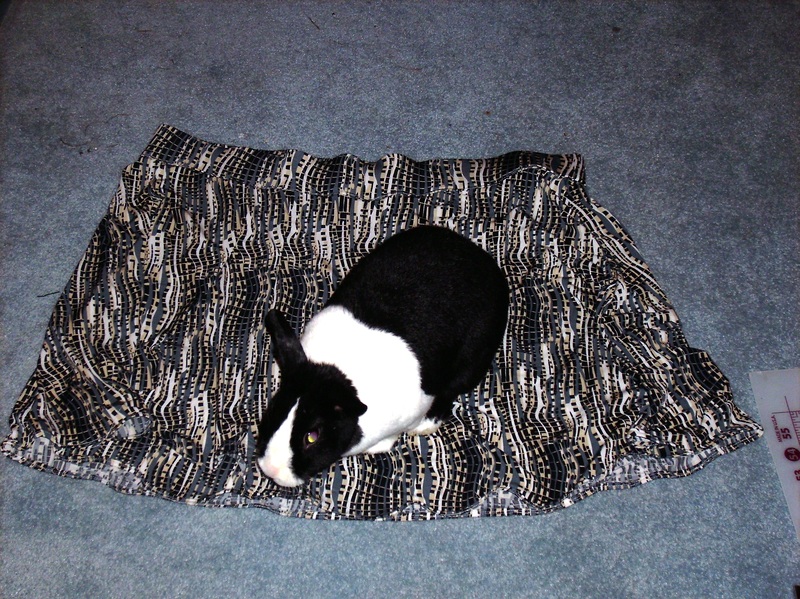 Otherwise, the skirt went together fairly fast. I think after I finished the pattern alterations, it only took two evenings to sew everything together. I did used a little bit thicker waistband and elastic for the skirt. I serged the bottom then rolled it twice for the hem.